Written in 1989 by Harold Northrop age 86 for his grandchildren to read so that they could understand how many changes have taken place. Reproduced here by permission of his daughter Maureen Ellwood. 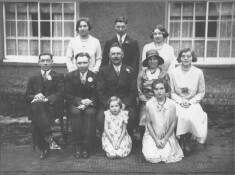 Harold Northrop’s family at his wedding. Living conditions were very poor. We lived in a house in Hurrells Row, two bedrooms and a living room, one of a row of 12 such houses. Several of the occupants also had large families such as ours. Our parents slept in one room and the other was separated by a curtain which separated the boys from the girls. On very cold winter nights the beds were warmed by hot bricks, the bricks being put in the oven for heating. All cooking had to be done on an open coal fireplace, mostly in a boiler. Mother was a good cook. She had been well trained as a cook in service before marriage and could make good substantial meals out of almost anything she could get hold of. Making sure we were always well fed was her first priority and considering all 8 of us are at the present time old age pensioners, is a tribute to her way of bringing us up under the worst possible conditions compared with today’s life style. Toilet facilities were non-existent, only the jerry pot under the bed, and the outside lav was a pail under a wooden seat. This was emptied in a pit dug in the garden where all household rubbish was also thrown. This was cleared out several times during the year and taken to the allotment in a hand cart. Flies were always in abundance and sticky fly papers decorated the house. Sanitary conditions, as stated, were very bad and this could have been the cause of a scarlet fever epidemic about the year 1911 in the village. Several children were affected and it was a common sight to see a horse drawn black carriage taking the patients to the isolation hospital at Oakington. My eldest sister was a victim of the illness. Our bedroom was sealed off and fumigated and my father had to go and sleep at my grandmothers for a time. Our water was obtained from natural springs which ran freely day and night in fountains throughout the village. This we had to fetch in pails for all our requirements. These springs have now stopped and water is supplied through the Cambridge Water Company system. This natural supply ceased to exist because of the lowering of the water level due mainly to the demands of industry such as Barrington Cement Works and Fisons Chemical Works and I suppose increase in the population. I started school at the age of 3, and was taken there and taken care of by one of our neighbour’s daughters. Our teacher in the infants class was a Miss Beaumont, daughter of the school master, Mr. Beaumont. Mr. Beaumont was a rather elderly man and he was followed by a much younger man a Mr Sadler. Mr Sadler was a very forward- looking man and a strict disciplinarian and was not above using the cane when necessary. He completely changed the whole set up at the school. For instance the old master would appear to sleep at his desk nearly all the afternoon and leave one of the older pupils to try and keep some kind of order. At this period I remember we were given cards of Boer War soldiers to draw from. Under Mr. Sadler a good woodwork class was introduced and some very good work was produced by some of the boys. Cookery classes were also introduced for the girls. He gave special attention to his most promising pupils and got several through to passing scholarships which in those days were very competitive. I was one of the successful ones and went to Haslingfield school for the examination which I passed, and then went to the Leys School at Cambridge for the final oral exam which was also successful. Unfortunately my parents were too poor to let me have the further education at the County School and I left school at the age of 13. The first world war was now well under way and Mr. Sadler was called to the forces and was unfortunately killed in action. The position of school master was filled by a Mr. Royston from Haslingfield school. When I was about 10 to 12 years old, during the school summer holidays. I used to be employed by Mr. Hays as a horse leader for the harvest. This meant leading the horses and wagons from stack to stack whilst the sheaves of corn were being loaded on the wagons for conveyance to the farm yard. About this time I was also employed before, between and after school hours by Sir Graham Greene’s sisters, Miss Mary and Miss Helen at Harston House. This entailed getting up early in the mornings and going to do the various duties allocated such as fetching milk from Mr. Wisbey’s dairy, cleaning shoes and pumping up water from a pump in the scullery to the upstairs water tank. After school I would be required to clean knives, fetch in logs and firewood and any other jobs which the servants might require me to do. On Saturdays I worked all day and besides my ordinary daily jobs I would have to assist the gardener clearing up leaves, cutting lawns etc. For this I was paid the princely sum of one shilling. When I had left school at the age of 13, for the first 6 months I was employed as assistant gardener and general dog’s body at Harston House, the residence of Sir Graham Green who was at the time Secretary to Winston Churchill who was First Lord of the Admiralty. He was also uncle to Graham Green the well known author. I left this job on March 17th 1917 at the age of 13 and was successful in obtaining a clerical position on the Great Eastern Railway at (the now demolished) Harston Station where my father was employed as a porter. Other employees there were another porter and signalman and myself.The station master was a Mr. Seaman who had just lost a son on the battleship Queen Mary in the battle of Jutland. Of course at this time all transport was dealt with on the railway. Milk was brought in from surrounding villages in churns for transport to London. Wagons of grain and hay were transported from the farms for transport mainly to London. Sheep were loaded at various times of the year in special cattle wagons to London. Horses were also carried in special horse boxes. At this period of time hay and straw was commandeered by the military for transport to France for mules and horses at the war zones. The station also supplied on hire sacks to farmers for their grain crops. This was very big business during the threshing periods and much appreciated by the farmers. When full these sacks weighed: Wheat 18st., Beans 19 st., Barley 16st., Oats 12st. This sort of weight was man handled on to wagons without any lifting appliances. In the main trains were the sole means of travel and first class passengers were very much especially catered for. I well remember when the then Sir Chas Walston of Newton Hail went to London with all his staff for the London Season. Mrs Nabit would come to the booking hall and collect and pay for all his tickets after his butler had previously been and given the number of 1st and 3rd class tickets he would require. Just to show how complex the Railway System was in those days – the Station Master, porters and myself were employed by the Great Eastern Railway, whilst the signalmen and plate layers were employed by the Great Northern Railway. This situation occurred when the railways were being built. The Great Eastern got as far as Foxton and so blocked the Great Northern from having access to Cambridge, they having got as far as Shepreth from London. Therefore the only way they could get trains into Cambridge from Kings Cross was to obtain running powers from the Great Eastern Railway. Apart from the railway, most of the men in the village were employed on the farms, some at the flour mill owned by Mr. Thomas Smith who was also a school governor. Mr. G. Williams, the Post Master was also a village notability. His method of delivering telegrams was to blow a whistle and us children would race each other to obtain the sixpence, which was a large amount in those days, which he gave to the first one who arrived to do the delivery. Mr. Lawrance was the village blacksmith and us kids used to love to see him at work shoeing horses and putting iron tyres on the wheels of carts, etc. He would mend our hoops for us and was a very genial man in later years. The smithy was taken over and run by his sons Victor and Harry. Mr. Willers was the undertaker and dealt with all the funerals, making the coffins, supplying the bearers, and all the other necessary arrangements. People used to pass away mostly in their own homes and their bodies were kept in the house until burial. This was rather a morbid business especially in most small houses. The corpse was carried to the church on the shoulders of the bearers and I well remember a woman whom we knew as Aunty Betsy, whom I thought at the time was rather elderly, walking in front of the coffin with a pair of trestles which she would put down at various points of the journey. The coffin would then be placed on them to give the bearers a rest. In our particular row of houses if the coffin with the body was in one of the bedrooms it could not be brought down the stairs so a bedroom window had to be taken out and the coffin slid down a plank to the ground. Mr. Stanley Rogers who lived at the windmill, now demolished on Newton Hill, used to run a kind of taxi service with a horse and trap. He also ran a fishmongers business and I had many a ride with him on his rounds to neighbouring villages. He also kept a very strong horse and had a small contract with the railway to do the necessary shunting at the station. Mr. Dilley was the saddler whose main business was repairing harness and other leather equipment for the local farmers. Us children used to go to him for whipcord to spin and drive our tops which at that time we were able to do with comparative freedom along the now busy A10 road which runs through the village. A Mr. Thompson, besides running a coal business, also ran a weekly carriers cart to Cambridge and occasionally would take a couple or so of women with him to do some shopping. He would also get things from Cambridge for anyone who might require something they could not get in the village. His son Norman was also the first person to run a bus service in the area under the name of Thompsons Buses. This was eventually taken over by the Premier Bus Company. Fred and Tom Newling, 2 brothers, owed 2 traction engines and threshing equipment and used to be contracted by farmers to thresh out corn from the stacks. I remember seeing a man with a red flag going in front of the engine when it was travelling along the road. Another owner of a traction engine was the farmer Mr. Rodwell. As far as I can remember it was mainly used for the conveyance of hay and straw. He also used to convey the Chapel School children on outings in a highly decorated wagon. Other farmers in the village were Mr. Hays, Mr. Rowley, Mr. Gee and Mr. Hurrell – most of the men in the village were employed by them. There were various grades of farm workers such as horse keepers, stockmen, dairy men, shepherds and the ordinary labourer. A Mr. Symonds was a thatcher he also used to make hurdles for sheep enclosures out of willow wood. Another very important person in the village was Doctor Young. He also served neighbouring villages. In the early twenties most of his journeys were done on his bicycle and beside manning surgery hours he was always available when needed at any hour of the day or night. It was his proud boast that he never lost a baby or mother in all the numerous births he dealt with. At this time all births were dealt with in the home and facilities were far from today’s standards. He also dealt with broken limbs, dental work, mostly taking out teeth when they were causing pain. I remember well when he was attending me after an accident I had caused by riding a bicycle into a fast moving horse and cart, which was taking milk from Haslingfield to Harston station. I was suffering badly from toothache when he arrived to visit me one morning. He immediately went to his black bag which hung from his bicycle, told my mother to hold me round the neck whilst I sat on a chair and without any freezing quickly pulled out the tooth which had a yellow abscess on its root. I also remember him attending road accidents especially one in which a car ran into a horse and trap. The shaft of the trap penetrated the car driver’s head and killed him instantly. The doctor pulled this out of his head. Besides all his numerous duties he found time to visit the school and give recitations to the pupils. Everybody appeared to have complete faith in him and this undoubtedly had a big effect on his cures. How he obtained his income must have been a problem as it was impossible for the poor to pay doctors fees, but then I don’t suppose anyone called on him unless it was very serious. Most relied on old fashion home-made remedies. One charge he always insisted on and which everyone concerned was well aware was, I understand, £3.00 for attending and dealing with child births. To keep us fit my mother used to dope us with liquorish powder and brimstone treacle every Saturday. This was supposed to keep our blood in order. As far as I can remember no one seemed to be sent to hospital during my young days. There never appeared to be such things as ambulances and the doctor was called upon to attend to every problem. After my accident I was unconscious for a couple of days and suffered badly bruised ribs but the only attention I got was by the doctor. My brother was also kicked in the face by a horse and knocked unconscious. His face was in an awful mess and we spent a lot of time fanning flies from his face. The only attention he received was from the doctor. Public houses also played a large part in the life of the village. The Swan which was burnt down in the late 1920’s was a popular one. It had a very large room which was used for dances, wedding receptions, harvest horkeys, etc. It also had outside a pump and a large water tank for the use of horses, and charabanc parties who stopped would take pleasure in throwing coins in the tank and watch us kids get very wet in trying to fish them out. The Pemberton Arms was also very popular, having ‘quoit beds’ where competition games were played with a number of Cambridge pubs, mostly on Saturday evenings. This, of course, was good for heavy drinking sessions. Most Public houses used to run a Xmas Club. Customers would pay about sixpence a week and a sickness benefit would be paid to any member who needed it during the year. The sum remaining would be shared out at Xmas and any member who had drawn out too much sickness benefit during the year was not very popular at Xmas. In the village there was 2 Bakers, a Mr. Badcock and Mr. Pearman, 3 Grocers, Mr. Park, Mr. Pearman and Mr. Spencer, a butcher Mr. L. January, whose son Douglas was the founder of the now well known firm of January Estate Agents. Food in those days was sold unpacked and weighed loose. None of the prepacked goods as supplied today. Shoes and clothes were mainly supplied by tallymen who collected the cost on a weekly basis. There was no such thing as electricity and light was by paraffin lamps and candles supplied mainly by Browns of Cambridge who came to the village weekly with a horsedrawn van. Mr. Haylock the landlord of the Three Horse Shoes public house did the necessary slaughtering of animals such as pigs, sheep and the occasional bullock. All, of course, were locally bred. Several families kept pigs, including my own father and occasionally one was killed for our own use. There were no refrigerators in those days and the pork used to be kept in large earthenware pots in salt brine. Most families were dependent on allotments for their main source of food. In my family’s case enough potatoes were grown to last throughout the year. All types of greens, brussel sprouts, cauliflower, cabbages of all kinds were always available. Onions, carrots, parsnips, turnips were also very plentiful, and I well remember weeding the onion and carrot beds. Also picking the brussel sprouts especially on frosty mornings with frozen fingers. Another duty myself and other children used to have to do was getting up early in the morning and walking the one and a half miles to Newton with 2 or 3 cans to obtain cheap skimmed milk for our own families and probably a neighbour; not very pleasant on a cold, frosty winters morning. We never had such things as bicycles until we were old enough to work and then it had to be on a credit system of so much each week. I was 13 years old before I could ride a bike and lots of children at this time never did ride a bike throughout their lives. The only chance one or two of us had to learn was when we were required to take the Rev Baldwin’s cycle to the station so that when he arrived now and again by train he could cycle back to the vicarage. When we now see children at the age of 3 years riding cycles it makes one wonder at the great change in our present life style. Motor cars were a rare sight and about the only one I remember in my young days was one owned by a Dr. Magoris from Shelford who ran a part-time surgery in the village. Its number I well remember was CE200. Employment was hard to obtain and several young men were forced to emigrate to Canada and Australia and some never returned. Our neighbour’s son was one who went to Australia and she never heard from him again. Day after day she would look for a letter but she never got to know what became of him. Girls, as soon as they were old enough, were either locally employed as servants at a very low wage by some of the better-off residents or went to Cambridge or London for a more higher class of service. Accommodation for the elderly and helpless was virtually non-existent and those unlucky enough not to have any family connections found themselves in great trouble. Two or three old men I remember well used to sleep very rough in stables and stacks. The lady previously mentioned, Aunt Betsy, who lived in Hurrells Row and Mrs. Haylock the landlady of the Three Horse Shoes public house would give accommodation to one or two of them. They probably were paid out of the new Old Age Pension fund started at this time by Lloyd George the Prime -Minister. A spectacular event I well remember was the army manoeuvres in 1912. On one particular day it was a constant passing of troops. Horse regiments, such as Dragoons, Hussars and Lancers with their lances held high. The Foot Regiments in their full regimental colours, the Scottish Regiments in their kilts and the various regimental mascots. One of their large camps was at Newton and Harston station was well used to supply their needs. I remember riding with one of the carriers transporting the various items to the camp such as barrels of beer, etc. and receiving a large hard army biscuit with a piece of cheese from a soldier employed in the large canteen at the camp. Most food was in short supply and only the very essential commodities were available and these on ration cards. Eventually the war ended and I well remember how happy we were to be able to obtain sweets, biscuits and chocolate again. I remember going to Shepreth station, we heard a penny slot machine was operating with bars of Nestles Chocolate, and was fortunate enough to obtain 2 or 3 bars. This was my first taste of sweet stuff experienced for a very long time. I also remember how people got the wind up when they heard the noise of Zeppelins overhead. We always made our own recreation playing hop scotch, skipping, marbles etc. and seemed to have had so much freedom compared with what the children have these days. We would play fox and hounds, cowboys and indians and roam all over the meadows and fields without the farmers or anyone appearing to object. The river meadows were uncultivated and endless days were spent during the summer holidays bathing and fishing in the river. Now all the meadows have been drained and cultivated and are closed to everybody. There appears nowhere for children to enjoy the pleasures of the countryside these days. The ditches used to be full of stickle-backs and red breasts (small fishes) which we used to catch and keep in jam jars. Newts, tadpoles and frog spawn was also plentiful, all these have completely disappeared. Most children used to attend Church or Chapel for various activities such as Sunday school, choir practice, Band of Hope bible classes, etc. and annual events used to be held. Church children were given an afternoon’s tea party with various competitive games such as races, skipping events, bat and trap etc. On one occasion we went on an excursion train to Yarmouth. This was indeed a wonderful experience for us, being the first time most of us had ever been on a train let alone going on such a long journey to the seaside. We had a wonderful day and I well remember seeing a flying boat at anchor. The Chapel school children’s outings used to be an exciting ride on a decorated wagon drawn by Mr. Rodwell’s traction engine to nearby villages for their picnic and sports events. An annual event which was very much looked forward to was the Village Feast which took place every Whitsun Holiday – Whit Monday and the following Tuesday – with Roundabouts, coconut shies, darts, hoopla’s. etc. It was held on our small village Green, the triangle patch between the junction of the A10 and the Haslingfield Road. Besides taking up all the Green it also took up most of the main road but as the motor traffic increased it had to be abandoned in the early thirties. For 2 or 3 years it attracted a vast amount of people from Cambridge and the neighbouring villages on the Whit Monday when a popular fete was held in which most of us children had a part to play. It was held mainly to obtain funds for the building of our Village Hall. Prior to the hall being built, most of the indoor activities, such as dances, whist drives, etc, were held in the school. Another event I remember was the coronation of King George the Fifth in 1911. Tea and sports were held in the cricket field and coronation mugs were given us by the mill owner Mr. Smith from the cricket pavilion. After a time (after WW1) we got back to our village recreations such as cricket and football. Those days there was intense village rivalry and teams were made up of purely local people. We used to cycle to villages sometimes miles apart competing in the Webber Cup cricket competition and if any of the teams won through to the final they were supported by large numbers of spectators from all the villages. Inspite of being one of the largest villages, we have never had a recreation ground. However, we had one of the most successful village cricket teams in the county. A very fine cricket pitch was created in a large meadow in the village centre which is known as “the Park”. We were allowed to play cricket here absolutely free by the owners, a Mr Hurrrell, in the early 19 hundreds and later by his son Col. Hurrell, who at one time was Lord Lieutenant of the county. In 1921, myself and my pal Ted Laman, both of us railway employees, went to London to see the F.A. Cup Final between Tottenham and Wolverhampton Wanderers at Stamford Bridge. We cycled to Cambridge station and caught a train at 6.00 am and returned from Liverpool Street at 11.30 pm. I had just ten shillings to go with. We had free railway travel and after paying the entrance fee to the football ground and enjoying a full day in London, having a drink or two and a snack, returned with a shilling or two still in my pocket. It makes me realise the extent of inflation since those years. Another London football trip I well remember was the first Wembley Stadium football final between West Ham and Bolton Wanderers in 1923. Myself and Ted Laman arrived early in London and as Wembley Stadium was advertised fully in the press as being able to accommodate all football enthusiasts who were able to go, we never troubled to get there very early and spent the morning going round the sights of London, such as St. Paul’s, Monument and Tower of London. etc. When at last we decided to make our way to Wembley at about 1.00 pm, we went to Piccadilly Tube Station and found the most awesome crush. Eventually we boarded a tube train and after a short journey were informed over loud speakers that no more trains would be going to Wembley and were given the choice to go back to town or wait in the train which would not proceed to Wembley until the crowds were suitably dealt with. We remained for some time in the train and eventually reached the stadium about 4.30 pm, far too late to see the match. We afterwards learned it was a miracle the match took place as it was estimated about 200,000 crowded in the stadium and poured out over the pitch. The pitch was partly cleared so the match could take place, mainly by a policeman on a white horse. Despite all the confusion there didn’t appear to be any serious trouble. What a difference to today’s football violence. Another episode in my later life was the 2nd World War 1939-1945. After the devastating defeat of our army in 1940 and the collapse of the French, we were left in great danger of invasion and it was at this point that Churchill called for volunteers to form a defence force. 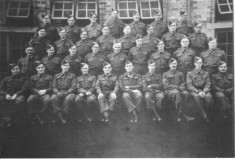 I was one of the first in the village to join the then Local Defence Volunteers which later became the Home Guard. I went to our local policeman a Mr. Lane, who appeared to be very worried that German parachutists might invade at any moment. He was very pleased that some response was being made in the village to join the Volunteer Army. A meeting was called and quite a good number of men folk attended and joined the L.D.V. A Mr. Seagrave who was a most forceful character was appointed leader and men who were in 1st World War were put in charge of various sections and some kind of elementary training was given. Eventually an army unit was posted in the village and we received excellent training such as rifle shooting, throwing hand grenades, Molotov bombs, phosphorous bombs for destroying tanks. At first we had only 2 rifles and these were used for night and dawn patrols. Two of us would be on patrol at a time. I remember on one occasion me and my partner thought we saw a suspicious light. We crawled up a very wet ditch to investigate and found it to be a rear light on a railway signal lamp. The village has now become much larger and the old residents of the pre-war period have been over-run by the new comers and the old village names have now been eclipsed. The population has been greatly increased and has now become a dormitory village with little or none of the old family businesses, ways or connections. The main street where we played tops and hoops is now the very busy A10 and it is a problem to even cross the road from one side to the other let alone play games as we used to do.